I have a thing for shortbread cookies. I also have a thing for edible flowers. So it makes total sense to combine the two in my mind! Dried lavender is an edible and medicinal flower that I always make sure to have on hand, because I use it all the time, like in this vanilla lavender lip balm or this plum and lemon upside down cake with lavender whipped cream. Yeah, that one was really good! 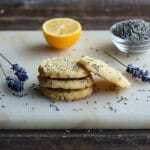 There is something special about the combination of lemon and lavender that goes together so well, and these lemon lavender shortbread cookies are a great way to enjoy it. 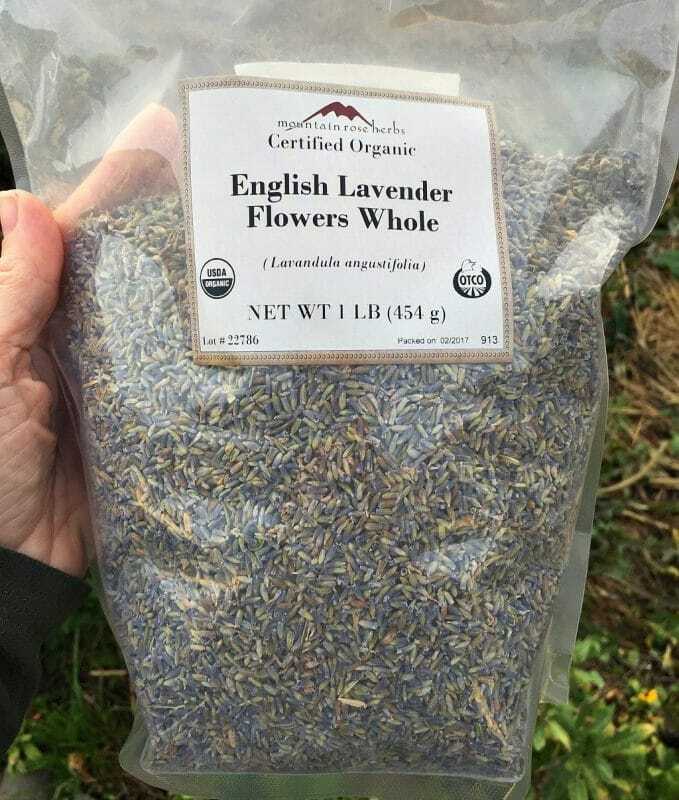 Of course I grow my own lavender, but it never seems to be quite enough for all of my herbal projects and recipes, so I always make sure to have bag of organic dried lavender from Mountain Rose Herbs in my herbal apothecary. 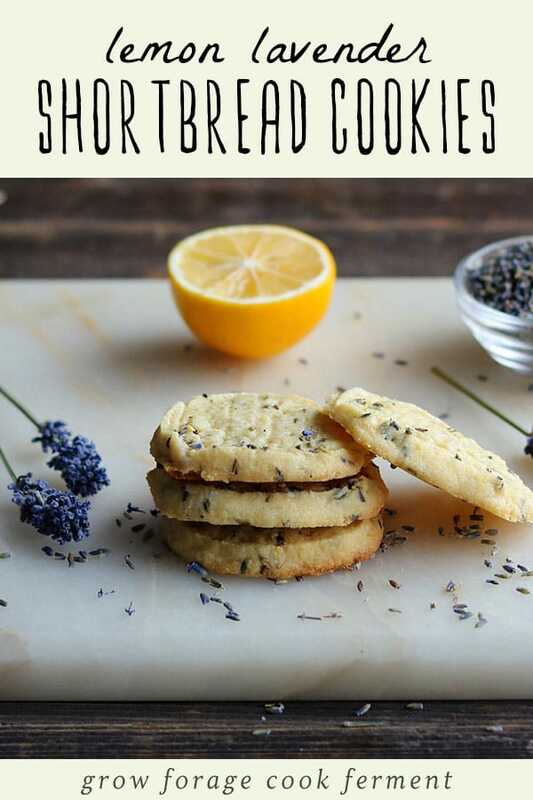 These lemon lavender shortbread cookies are especially tasty if you use Meyer lemons, but any lemon will work. Most lavender varieties are edible, but some are tastier than others. Lavandula angustifolia is my favorite variety to use. 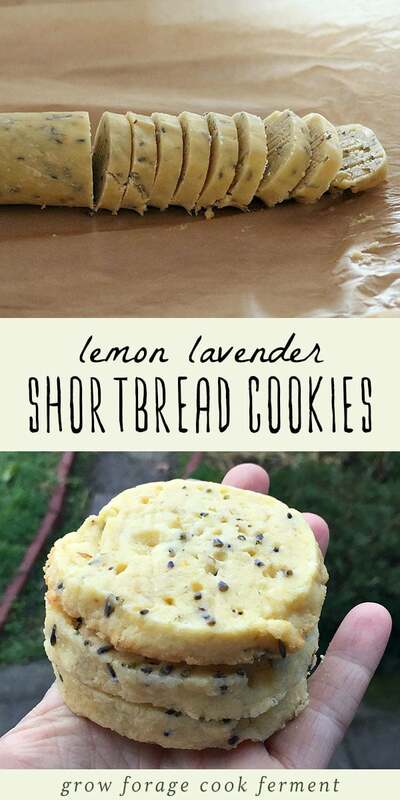 These lemon lavender shortbread cookies are so delicious! They are like spring in a cookie, buttery, lemony, and slightly sweet. The lavender flavor really shines through! I have several other shortbread cookie recipes, too! I told you that I have a thing for shortbread. They are the perfect cookie! 1 Tbsp lemon zest a microplane is the best tool for this, hands down! Cream together the butter and sugar, then add the egg yolk, lemon juice and lemon zest, and stir to combine. Then add the flour, arrowroot, dried lavender, and salt. Stir everything together until the dough begins to hold together. Take it out of the bowl and form it into a log shape. 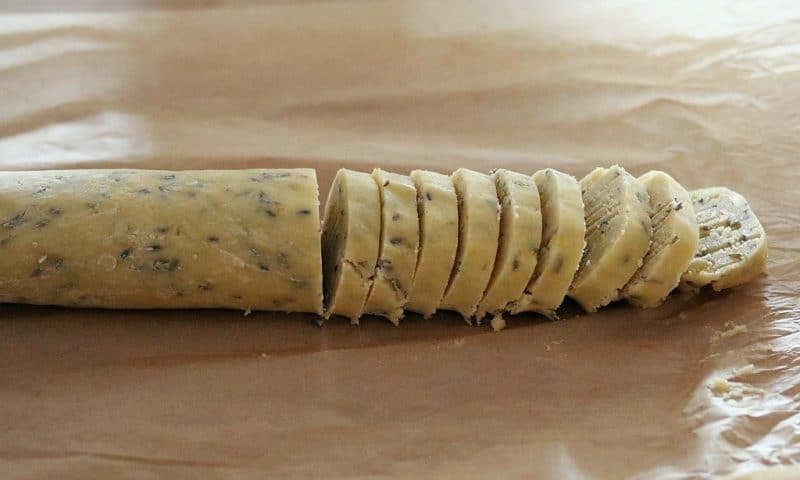 Wrap the dough log in parchment paper, twisting the ends to help hold it together. Put the dough in the fridge or freezer for about 30 minutes, or until firm. When ready to cook, preheat the oven to 300°F. Slice the log into 1/4 inch rounds, then place the rounds on a parchment lined baking sheet, about an inch or so apart. Bake for 25-30 minutes. Check them closely after 25 minutes, as they will start to brown pretty quickly. Take them out when only the edges just barely start to turn golden. The centers will still be fairly soft. Let them cool on the baking sheet for several minutes before transferring them to a cooling rack. They will firm up as they cool. You can store the dough log for several days in the fridge, or for several weeks in the freezer, if need be. If you want to make different shapes, instead of forming the log you can alternatively refrigerate the dough as a flattened disk, then roll it out on a floured board and use a cookie cutter. Cornstarch or arrowroot helps to make them more tender. Glad that you liked them! I thought these looked good so I tried it. This is the perfect cookie to go with a cup of tea! It was just as described! I really enjoyed it! Thank you, Colleen! Looking forward to your newsletters. Thank you. Dead easy to make. Delicious to eat. 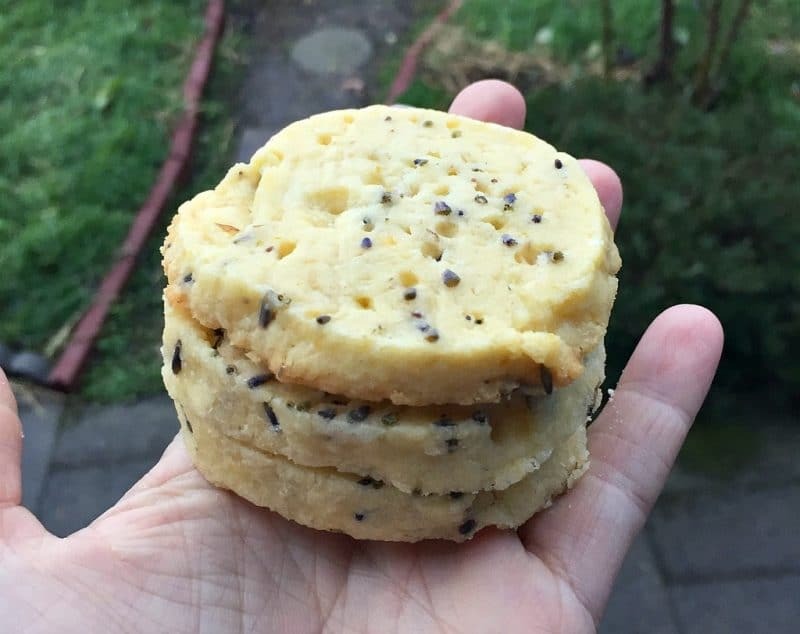 This is my “go to” recipe for lavender cookies. I use flowers harvested from my own garden. These look delicious & beautiful! I also love the combo of lemon & lavender! It’s a favorite of mine when I make soap, although I use litsea cubeba essential oil instead of lemon essential oil because it takes a lot longer for its scent to fade. I really love reading your blog, thanks for all that you share!